At Loop Abroad, we know that sending your child abroad is a big decision. Traveling abroad can and should be a wonderful adventure, but finding the right program can take a lot of research. We know that parents and students share many questions: What will the students do every day? What will they get to see? What kind of students will be traveling with them? But parents also have some questions all their own: Who will be supervising the trip? What safety precautions are in place? How do we afford the trip? We arrange group flights for most of our programs. Our priority is finding a good, affordable flight on a reputable airline. As flight availability changes each year, so does our choice of airport and airline. You will find general info on group flights, including estimated cost and departure city, on each program page. Detailed information on group flights will be sent directly to enrolled students. For group flights, Loop Abroad will have staff at the departure airport to assist them in meeting their group, checking in for their flight, and knowing everything they need to know for the trip. Some flights may have a Loop Abroad staff member on board. All students on group flights will have a travel plan and will have on-call Loop staff that they can reach by phone in case of an emergency, delay, or cancellation. Students are responsible for their own travel to the airport at least two hours before departure. Parents are welcome to travel to the airport with your child to meet the airport staff, or to have your student travel on his or her own. You will receive more information about flight day details as travel time approaches. On travel days, Loop Abroad provides not only airport staff but a 24/7 support phone number so that students who need special assistance, such as someone who missed the flight, can receive the help they need. When the group arrives together at their program country, Loop Abroad staff will meet them at the airport and transport them to their program location. After the trip, students will return to the airport, where a Loop Abroad staff member will be available to assist them in their onward travel plans. From there, they are responsible for their own travel home. Parents may pick them up at the airport, or they may fly home on their own. On occasion, when a flight leaves early in the morning or arrives late at night, out-of-state students might find they have to stay overnight near the airport. We can help students arrange and share hotel rooms in this situation, and will put a Loop Abroad staff member in the hotel for the evening as well for your convenience. Students are responsible for paying for their own hotel rooms if this is the case, and sharing rooms is a great way to help defray this cost. Flight information for summer programs generally becomes available by December. At that time, flights will be reserved and families will be notified that they are to book their flights directly through the travel agency. All your flight information will be provided to you, and you’ll be able to book over the phone or online with a credit card. You can make partial payments toward the flight if you prefer. Flights must be paid in full 35 days before the trip begins. For programs offering a group flight, we provide an estimated flight cost on the program page so that you can properly budget for the program and decide which program choices are affordable for your family. To date, our group flights have always been the same as or lower than the estimated cost provided. When group flights are available, we ask that all students coming from the US fly on the group flight. We often have parents request that their student fly on a separate itinerary either because they want to book the flight with miles or because they have found a shorter itinerary from their home destination. While we can accommodate such requests, we strongly encourage students to fly on the group itinerary. Students flying on their own itinerary will be responsible for a fee in each direction (fee is dependent on the program country, but starts at $150). Please contact us about appropriate times for independent arrivals for your student’s particular program. This fee allows students to be picked up and/or dropped off by Loop Abroad staff, transported to join the group, and any housing and meals provided during that time. If a student flying alone gets delayed or his or her flight gets canceled, there is very little we can do to assist them. With layovers, one canceled flight could leave a student stranded in an unknown airport alone. We encourage students to fly with the group if possible, and over 95% of our students choose to do so when a group flight is offered. For students who are combining Loop Abroad programs or who are traveling from outside of the US, there is no fee for flying off of the group itinerary. However, there are guidelines as to appropriate windows of time for arrival and departure. Please talk to Loop Abroad before booking any air travel. While we don’t like paperwork any more than you do, it’s important for us to have accurate information about our students and their families so that we can keep them safe and serve them well. The application for any program can be completed entirely by the student, but your child may need help from you preparing a few things. For a student to apply to any Loop Abroad program, they must provide a transcript. An unofficial transcript copy is fine. If your child is under 18, he or she will have to certify that he or she has parent permission to apply before submitting the application. The $50 application fee is non-refundable. If your child is applying for financial aid, he or she will do so at the same time he or she applies for admission. We ask that students include a copy of their parents’ tax return in their financial aid application. College students may use their FAFSA instead. It is perfectly fine to black out personal information in this document. It is extremely important that you complete the paperwork completely and truthfully. Omitting or altering information, particularly about the student’s health, is unsafe. Falsifying information on these forms can result in your child being dismissed from or prohibited from attending his or her program and may have legal consequences. The enrollment paperwork also includes a Medical Form which needs to be completed by a doctor. In general, we communicate directly with enrolled students. Your son or daughter, once enrolled in a Loop Abroad program, will receive important information and updates from us, including invoices. It is their responsibility to share this information with you. In some cases, we may be unable to share student information directly with parents. Each student will need a passport that is valid for at least six months after their trip ends. That means if your student’s trip ends on July 28th, his or her passport will need to be valid through January 28th of the following year. Any student who has a greencard will also need his or her greencard to travel internationally. 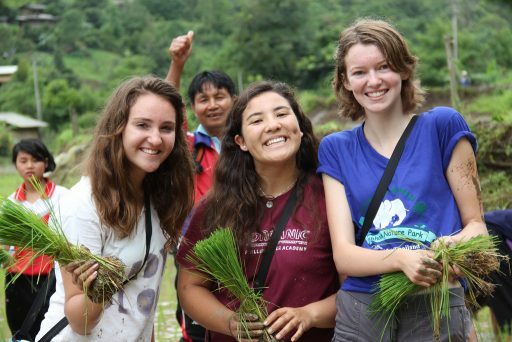 Learn more about Loop Abroad’s School of Record, Iowa Wesleyan. Each of our programs awards participants with a certain number of service hours. Check the program page to see exactly how many service hours a student will earn. If students need to hit a higher service hour threshold, we can help them to design a project that they can carry out ahead of time or in the evenings during their trip to meet their service hour requirement. 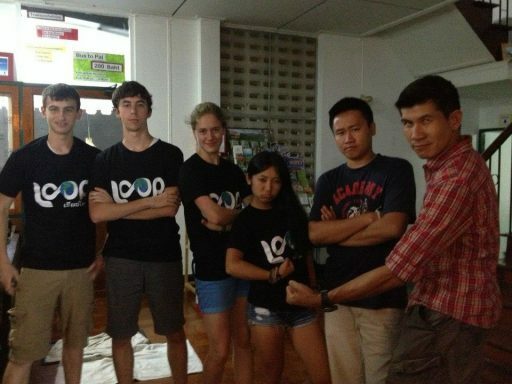 We are always willing to help support our students in any additional projects they want to do to build on what they’ve learned and experienced during their Loop Abroad program. 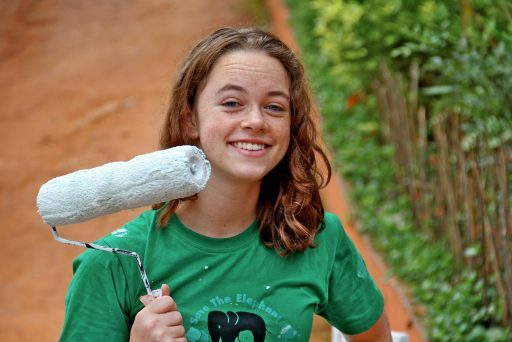 Many of our past students have used their experience as a stepping stone toward internships, research positions, fundraisers, writing and art projects, and presentations related to helping conservation efforts or developing countries. We offer college credit for most of our programs through our School of Record, Iowa Wesleyan University. 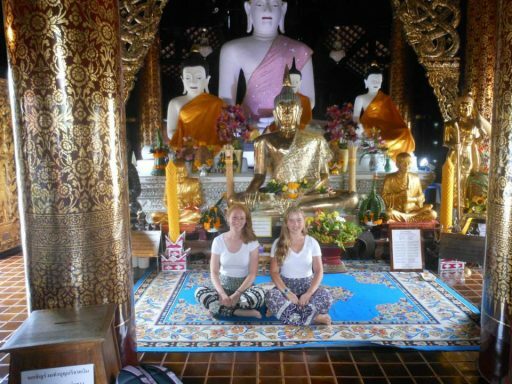 For semester programs, the cost of credit and transcript is included in the Loop Abroad tuition. For short-term programs, students wanting credit from Iowa Wesleyan University pay an additional $360 fee for credits and official transcript, and must complete course requirements such as an exam and a final writing assignment. We can help students who are currently in college work with their schools ahead of time to accept the transfer credit, or to issue credit directly. For students who are not in college yet, they can still receive the IW transcript and credit, and how any future school accepts that transfer credit will be at the school’s discretion. If you have questions about credit or need assistance, please contact us. 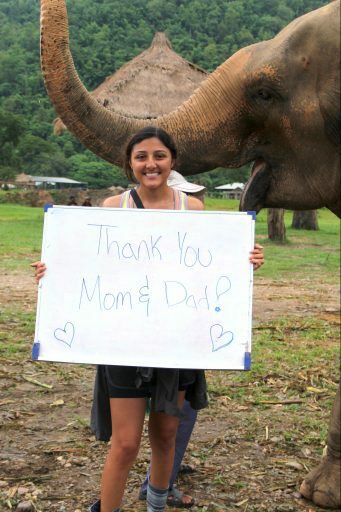 Over 75 colleges and universities have given students credit for their participation in Loop Abroad programs. Many of our program pages list the number of veterinary, animal experience, or research hours that a program provides. When students apply for vet school, one thing they are asked to record is their relevant experience hours, sorted into these categories. For this reason, we provide information on veterinary hours on the program page. For students who are not interested in applying to vet school, this information is irrelevant, but it won’t affect their program at all. • Drink plenty of water. Filtered water is provided for students at all meals and in all accommodations. • Wear bug spray at all times. Depending on the program location, we may even ask that students wear bug spray when inside. • Wear sunscreen when outside. This is particularly important in our Ecuador locations and at marine programs. • Eat sufficient food at all meals. The Packing List has suggestions of snacks that picky eaters may want to bring to help be sure they are comfortably and happily eating enough. • Sleep in the evenings. If a student is unable or unwilling to do any of the above, he or she may be asked to sit out of activities until it is healthy and safe for him or her to continue. Drinking sufficient water and eating enough at meals are incredibly important to staying healthy in an active environment, especially in hot weather. Additionally, carefully reading the packing list and packing the clothes needed to be comfortable and safe will help students to stay healthy (and also to have a great time). Remember that at some program locations (Anywhere in the Southern Hemisphere), North American “summer” is their “winter”, and the further South you go, the colder winter can be. Items like a coat, hat, rainboots, closed-toed shoes, rain gear, suncap, or other protective clothing are included on the packing list for certain programs because they will help students stay healthy and comfortable. Students should feel welcome to ask us ANY questions about the packing list, since everyone is different and we don’t want students to buy or carry around items that they will not use. The above precautions, as well as treating any minor cuts and scrapes with antibiotics and covering them, help avoid most of the common ailments suffered by travelers abroad. When a student is accepted to the program, the required paperwork will include a Medical Form that must be signed by a doctor. Omitting any information from this or other enrollment forms, whether or not it seems relevant to you, puts your child at risk. Please equip us to keep your child safe and healthy by giving us all the information we need. Generally, Loop Abroad students are not allowed to consume alcohol or smoke cigarettes during their travel with Loop Abroad. (Exceptions include the Vet School Veterinary Service program and the Veterinary Semester Abroad program, which permit of-age students to consume alcohol in moderation during their free time and outside of Loop Abroad housing.) This applies even if they are of legal drinking or smoking age in at home or according to the host country laws. This applies even if their parent or parents permit them to drink alcohol or smoke at home. Drinking alcohol or smoking during the program may result in a student’s immediate dismissal from the program. Disciplinary infractions will be handled by the Loop Abroad staff on a case-by-case basis. Loop Abroad has an absolute zero tolerance policy toward the possession, distribution, or use of marijuana or other illegal drugs. This includes prescription drugs that are not prescribed in the student’s name. The penalties for possession of marijuana in Thailand, for instance, are extremely severe, and can include life imprisonment without access to a US embassy or lawyer. Any possession by a foreigner, of any amount, can be treated as a trafficking offense, which can be punishable by death. As such, we can have absolutely no leniency in this rule. Any student who brings marijuana on the trip will be sent home immediately, on their own, at their parents’ expense. We have never had an infraction of this rule, but we want to be exceptionally clear that this trip is NOT the place to test the boundaries of this rule. Please note that because international, federal, and state laws are inconsistent and always changing, we cannot permit marijuana or hemp products (including cannabis oil) even if such items are legally prescribed and/or legally purchased. Each Loop Abroad student is required to have medical insurance that covers treatment during their Loop Abroad program. The student is responsible for the costs of any medical treatment required during the program, and parents share that responsibility if the student is under 18. You should check with your insurance provider to ensure that foreign coverage is included in your child’s medical coverage. You may want to purchase travel insurance that specifically includes medical coverage abroad, which can usually be done for under $50. We can help you find a plan that meets our insurance requirements. For anything beyond small cuts and scrapes, minor headaches, low fever that responds to painkillers, jetlag, or similarly minor injuries and illnesses, our general course of action is to take the student to the doctor. From some program locations, the hospital is a five-minute walk. From other locations, it’s 1-2 hour drive. Our staff are always aware of the nearest and best healthcare facilities. For most programs, no vaccines are required. We always suggest that you check with a travel doctor and consider CDC recommendations for what vaccines or preventatives he or she suggests for your child. Our Veterinary Semester Abroad requires that participants be vaccinated against rabies. Students will be provided with filtered water for drinking at meals and all times in between. We can accommodate most dietary restrictions (vegetarian, vegan, allergies, etc) that we know about ahead of time, and we try to provide meals that are appealing to all our students. Please be aware that at some program locations there is a limited meal variety available, especially for students on special diets. If you have questions about food options on your child’s program, please contact us. Students may experience some minor stomach upset in the first few days of travel due to food and water being different from home. Some travel doctors will provide a prescription for Cipro to treat traveler’s diarrhea, but most of the time this is far from severe and lasts only a few days. We encourage students to let their staff member know if they are feeling sick or experiencing any stomach upset, so that we can make sure it doesn’t last too long. 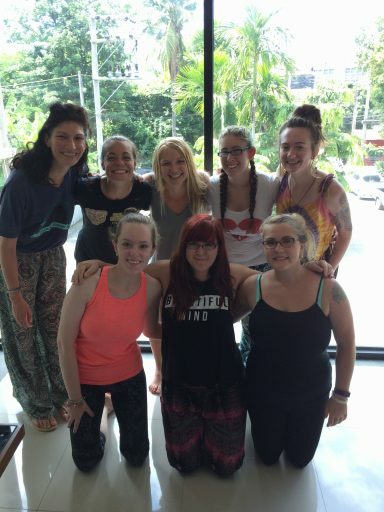 We believe that our students themselves are the number one thing that shapes their experience, and that one of the biggest benefits students gain from a Loop Abroad trip is the amazing friendships they make with other students from all over the country. But a close second has to be our faculty, who help to make each program what it is. Generally our programs have a maximum of 10-12 students per group. While we may have many groups in-country or on-site at a time, each group has its own faculty member: a veterinary for veterinary programs, and a field experience for marine or conservation programs (Masters Degree or higher). This allows each student to receive personalized attention during their program and to learn from one another in the group. 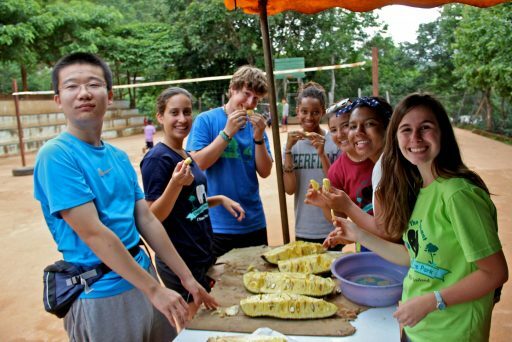 High School groups often also have a trip leader, which is usually a college or vet school student (age 21+) who has traveled with Loop Abroad before and has been chosen to assist the group each day. Get to know some of our faculty here. One of the greatest assets we can offer to students is the time spent learning from experts in their field and being around people who are successfully following their dreams. 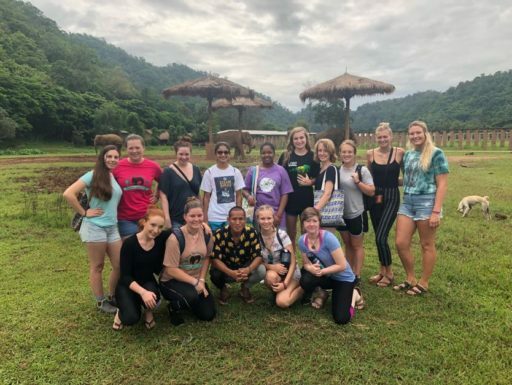 Our veterinary programs each have a vet as the faculty member leading their group, and many program sites offer students the chance to learn from multiple veterinarians on the Loop Abroad faculty. In addition to each group’s faculty member, each facility has Loop Abroad staff to facilitate daily activities and assist when needed. Generally each site has a Site Director who is in charge of health and safety and daily logistics for the site, and most sites also have a support staff to help when needed. In addition, groups may have facility staff, tour guides, language teachers, or other staff to support their group. For summer programs, there is 24/7 staff on-site with the students at all times. All parents for students under the age of 18 are asked to approve a sign-out policy in the enrollment paperwork, but the policy is the same for all summer program groups (other than our Vet School group for current vet school students). At certain times, such as in a mall or market setting, we like to let the students shop and walk around in smaller groups for one or two hours. Our sign-out policy requires groups of two or more (usually four) to sign out a Loop Abroad cell phone, which they must have with them for the duration of the sign-out time. The group must stay together, must answer the phone if it rings, and must return to the designated meeting place on time. If any of those conditions are not met, no one in the group is allowed to sign out again. So far, students have a perfect record and no one has lost their sign-out privileges. During sign-out time, staff are in the area and can be reached by phone if needed. If your child is under 18, you can choose to opt out of sign-out time and have a staff member with your child at all times. Some programs do not offer any sign-out time, and students are with their staff the whole time. Our Australia Veterinary Service program offers a free day in Sydney, where students can arrange their own activities. Staff will be available to assist but will not go with the students on activities they choose for this day. If you have questions about location safety, staffing, program schedule, or really anything, please don’t hesitate to contact us — we’re happy to help!